83546331(WAonly) Tile Grout Cleaning, Marble Grind/Polish. Parquet Wood Sand/Varnish, All Floor Restoration Specialist, TipTop Cleaning Services Specialized in Carpet & Upholstery Steam Cleaning, Blinds/curtains - WE DO IT ALL!!! 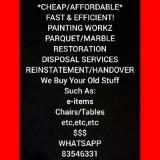 WhatsApp 83546331 Marble Grinding/Polishing, Tile Grout Cleaning, Parquet Repair, sanding/varnishing, Area Rug Cleaning, Leather Cleaning, Carpet & Upholstery Cleaning, Blinds/Curtain Steam Cleaning, All other handyman works, eg: painting, plumbing, etc.